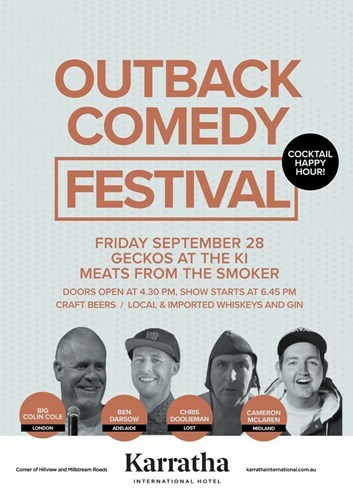 Come and enjoy a hilarious evening at GECKOS at The KI with the wackiest, wildest and funny show ever bought to the Pilbara. Its time to get off the net, get off the couch, get out of your donga -- and get laughing!! Headline act direct from London is massive on the British comedy scene its - "Big Colin Cole". Joining him one of Australia's hardest working live comics South Australia's fabulous "Ben Darrow", to temper the tone its the gentle giant who interferes with Perth airport flight path direct from Midland its "Cameron McLaren" and to complete the comedy combo your anarchic anchor-man is the dashingly deluded "Chris Dools Doolieman". Menu includes BBQ smokehouse meats, Brisket & Pork Ribs including our fabulous Firepit menu - pig and lamb on the spit.